Ownerless property, rendered so either by the formal renunciation of the owner, or by an act of the court (Giṭ. 36b), or by the death of a proselyte who has left no Jewish heirs (B. B. 149a; Maimonides, "Yad," Zekiyyah, i. 6). Property found in seas, rivers, or deserts is also supposed to be ownerless, and comes under the category of hefḳer (Shulḥan 'Aruk, Ḥoshen Mishpaṭ, 273, 12, 274, Isserles' gloss; comp. B. Ḳ. 81a, the ten institutions established by Joshua; see Taḳḳanah). In all these cases property of this kind is acquired by the first who cares to take possession of it. The renunciation of ownership in property, whether movable or immovable, in order to be valid must be made in the presence of three men (Ned. 45a). The formula of such a renunciation is very simple: "This my property shall be hefḳer." If no one takes possession of the property during the first three days, the previous owner may retract his original statement, but not after that, although he can always acquire possession of it in the same manner as any one else (Ned. 44a; comp. R. Nissim ad loc. ; "Yad," Nedarim, ii. 17; Ḥoshen Mishpaṭ, 273, 9). The renunciation is valid only when made in general terms, not when it is declared hefḳer only to a certain class and not to another class, as when one declares it hefḳer for the poor and not for the rich (Peah vi. 1; Yer. Peah vi. 1; B. M. 30b; comp. "Noda' Biyehuda," series ii., to Yoreh De'ah, 154). As to whether property is legally hefḳer if one or two individuals have been specifically excepted by the owner, compare "Naḥalat Ẓebi" to Ḥoshen Mishpaṭ, 20, 1. With a few exceptions, the manner of acquiring is the same in case of hefḳer as in other cases (see Alienation and Acquisition). While usufructuary possession for a period of time is sufficient to establish a claim to real estate when the claim is that it was sold or given away (see Ḥazaḳah), such possession is not sufficient in the case of hefḳer, where possession must consist of actual acquisition of the object (B. B. 54a). Painting one portion of a wall in a house, or plowing a field with the intention of taking possession of it, is sufficient ("Yad," Nedarim, ii. ; Ḥoshen Mishpaṭ, 275). All the poor-laws that pertain to land are disregarded in the case of hefḳer property. 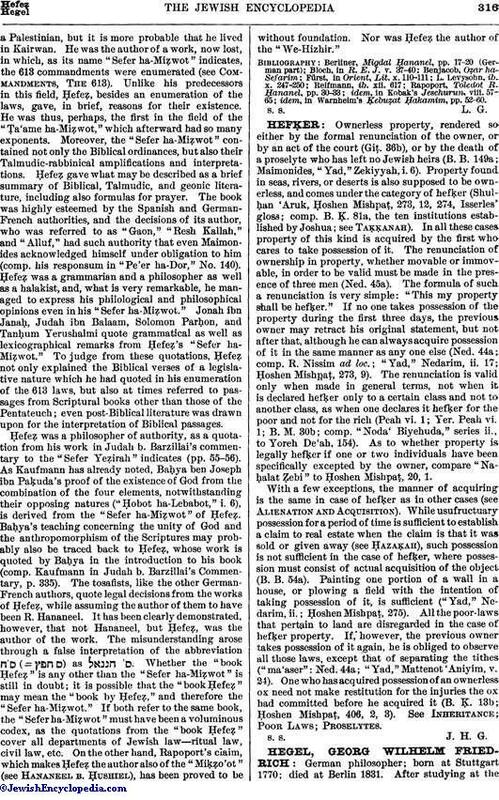 If, however, the previous owner takes possession of it again, he is obliged to observe all those laws, except that of separating the tithes ("ma'aser": Ned. 44a; "Yad," Mattenot 'Aniyim, v. 24). One who has acquired possession of an ownerless ox need not make restitution for the injuries the ox had committed before he acquired it (B. Ḳ. 13b; Ḥoshen Mishpaṭ, 406, 2, 3). See Inheritance; Poor Laws; Proselytes.